Graciously grant to your Church, O merciful God, that, gathered by the Holy Spirit, she may be devoted to you with all her heart and united in purity of intent. Through our Lord Jesus Christ, your Son, who lives and reigns with you in the unity of the Holy Spirit, one God, for ever and ever. Three things made Francis of Caracciolo stand out from his wealthy Neapolitan friends: he was powerfully drawn to our Lord in the Blessed Sacrament, he fasted every Saturday in honor of the Virgin Mary, and he had a generous love for the poor. When he was seriously ill at the age of twenty-two, he vowed that if he were cured he would devote himself to the service of God and his fellow men. He became a priest and in 1588 joined the order of Minor Clerks Regular. 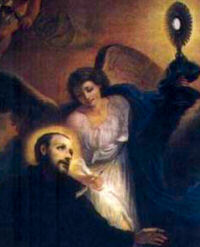 Francis instituted perpetual adoration as one of the works of his Order. According to the 1962 Missal of St. John XXIII the Extraordinary Form of the Roman Rite, today is his feast. It is also the feast of Our Lady, Queen of Apostles. Francis founded the Order of Minor Clerks Regular with St. John Augustine Adorno. The congregation's apostolate was preaching missions and performing diverse works of charity. In the course of time he became known as "Venerable Father, the Preacher of the Love of God," a title merited for promoting devotion to the Blessed Sacrament and introducing nocturnal adoration in his community. He had a childlike love for the Blessed Virgin; his greatest joy was to be of service to his neighbor. God endowed him with the gift of prophecy and the discernment of spirits. At the age of forty-four, while praying one day in the church at Loretto, he recognized that his end was near. Immediately he went to the monastery of Agnona in the Abruzzi, and exclaimed as he entered, "This is my final resting place." Shortly after, he was stricken with fever, received the last sacraments with deepest fervor, and quietly fell asleep in the Lord. The Church selects our saint's zeal for prayer and his spirit of penance for emphasis in today's Collect, and proposes these two virtues for imitation. "In imitating him grant that we may make such progress that we may pray without ceasing and constantly have our bodies under subjection." This is not an easy task; the liturgy, therefore, provides the needed assistance, the example of St. Francis, and the holy Eucharist. Patron: Naples, Italy; Italian cooks. St. Francis Caracciolo was much sought after as a confessor while his exhortations brought to repentance numerous public sinners, and he fortified the wavering and the despondent by personal encouragement and the recommendation of the two great Catholic devotions, those to the Blessed Sacrament and to Our Lady. Read this longer biography to find out more details about his holiness. Cook up some Neapolitan (from Naples) type of Italian cooking, such as the Insalata di Rinforzo, as St. Francis is the patron of Italian cooks. He came from a wealthy and powerful family, born in the family castle at Villa Santa Maria in the Abruzzi province of Italy. As a youth he enjoyed hunting and other sports, often entertaining large hunting parties. These parties would have wonderful dinners prepared by the palace chefs. These chefs were so good that they accompanied the family to Naples during the winter season to learn the Naples (Neapolitan) cuisine as well as the Abruzzese. "The perfect model of this spiritual and apostolic life is the Most Blessed Virgin Mary, the Queen of Apostles, who, while she lived on earth the life common to all, filled with labours and care of her family, was always most closely joined with her Son, and cooperated in the work of the Saviour in an entirely singular way. Moreover now, assumed into heaven 'by her motherly love she takes care of the brothers of her Son who are still on the way [to their eternal home] and who are involved in dangers and difficulties, until they are led to the blessed Fatherland.' 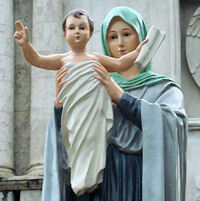 Let all most devoutly honour her, and commend their life and apostolate to her motherly care." Missionaries are urged to look upon her as the Queen of Apostles: "Realizing that it is God who brings it about that His Kingdom comes on earth, let them [missionaries] pour forth their prayers together with all the faithful, that through the intercession of the Virgin Mary, Queen of Apostles, the nations may be led as soon as possible to the knowledge of the truth..."